The best way for us to answer this question is to give a few examples. 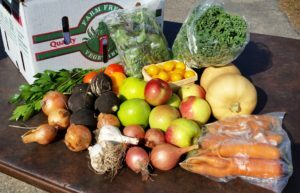 The shares will change with the seasonal produce availability on our farm, and this is all part of the fun! You will see the evolution from early season vegetables that thrive in the cool spring weather to our heat-loving tomatoes and beans during the summer. 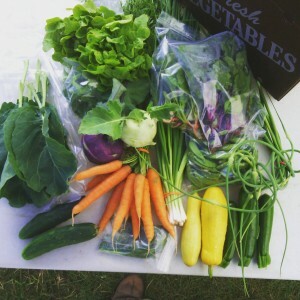 Each box will also include a newsletter with tips & recipes, stories from the farm, and more. Members also get to enjoy occasional artwork from our Farm Artists. More examples are available (with pictures) by exploring past seasons newsletters and our facebook page. 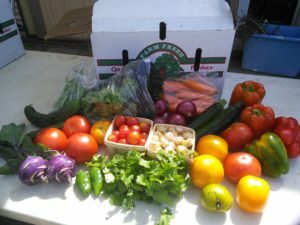 Tagged Amherst, Appleton, CSA, Custer, Stevens Point, Vegetable Share.